EOO 4100 km², a range restricted endemic to the mountains of the Western Cape formerly listed as Rare. There are however at least 20 known subpopulations all occurring within formally protected areas. This species is not considered rare or threatened. Hottentots Holland Mountains to Cold Bokkeveld Mountains. Fynbos, occurs on steep, rocky slopes (usually south-facing in in areas of high winter rainfall), altitude 500-1700 m.
A. haemanthifolia occurs on high, inaccessible mountain peaks. All known subpopulations occur within protected areas. Glen, H.F. and Craib, C. 1993. 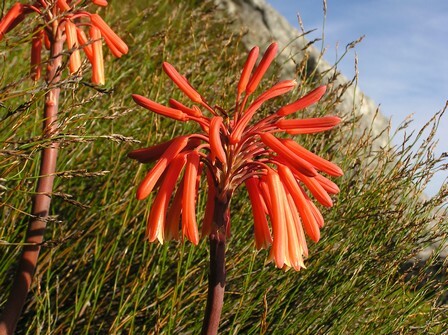 Aloe haemanthifolia. Flowering Plants of Africa 52(2):t. 2063. Manning, J.C., Boatwright, J.S., Daru, B.H., Maurin, O. and Van der Bank, M. 2014. A molecular phylogeny and generic classification of Asphodelaceae subfamily Alooideae: A final resolution of the prickly issue of polyphyly in the Alooids? Systematic Botany 39(1):55-74. Van Wyk, B.-E. and Smith, G. 2003. 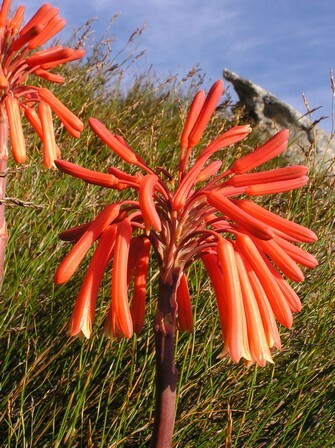 Guide to aloes of South Africa. (2nd ed.). Briza Publications, Pretoria.